Proving 'Funny Conservative' Isn't an Oxymoron. Petty criminals are living in a golden age. Never before in the history of mankind have the elites of Western society been so concerned with the inconvenience enforcing the law imposes on the lawbreaking community. Our ruling elite has this naïve belief the order they see in the more fashionable parts of their respective cities is the natural state of man. When in truth, Devil’s Night in Detroit is the natural state of man. In Washington, DC the city council is most concerned about the law violating people. This “fare evasion” worry is an offshoot of the “mass incarceration” delusion that posits minorities are being rounded up and thrown into prison on an unprecedented scale. It’s difficult to understand how people residing in a jail, after having been convicted by a jury, constitute an outrage. Common sense would conclude mass incarceration is a result of mass lawbreaking, combined with improvement in law enforcement technology. It’s not a chicken or the egg question. It’s a chicken, egg, omelet progression. The defies all logic part of the city council conundrum is how easy it is to avoid being arrested for fare evasion. The choices are practically endless. Pay the fare. Walk. Take a cab. Ride a bike. Carpool. Stay away from the Metro. None of those choices result in arrest. Only the choice to break the law results in arrest. 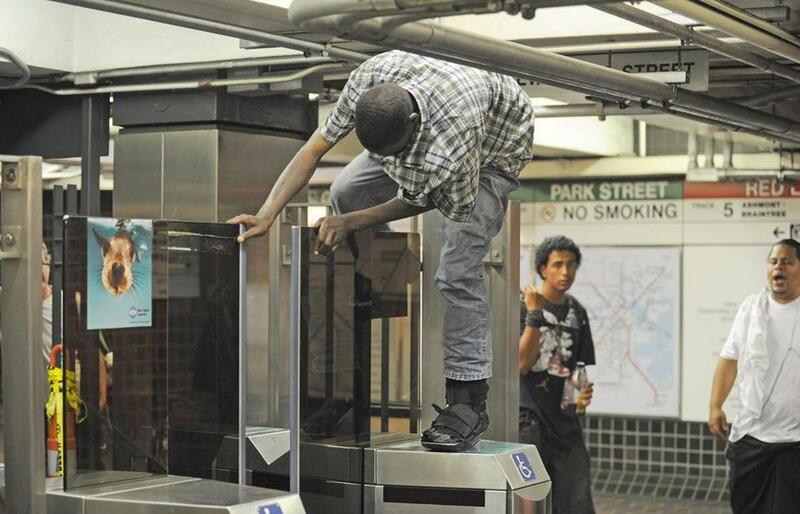 In 2015 the entire state of Washington decriminalized turnstile jumping for minors. Their excuse being “such convictions would give teenagers criminal records and that it would be difficult for them to make it to court to challenge a citation.” Unless the court is on a subway line. Removing responsibility for teenagers is the real pipeline to mass incarceration. The WaPost may contend it’s “unclear whether decriminalization has led to more fare evasion.” But I can give you a hint. Ask an illegal, during a break between demonstrations for his “rights,” what lax enforcement has done for the border–jumping community. This is where the incoherence of the left’s philosophy regarding responsibility and maturity is so obvious. According to the cultural Marxists who rule us, a four-year-old boy is mature enough to decide if he wants to grow up as a man or a woman and start a drug regimen that will affect him the rest of his life. While a 16-year-old male is not quite mature enough to evaluate the consequences of breaking the law. One of the tools used to beat law enforcement into submission is statistical disparity. Cherry–picking data is the greatest gift to race hustlers since Jesse Jackson’s first paternity suit. A New York group contends arrests for fare evasion happen more often in low–income neighborhoods. This has all the scientific rigor of the claim that you won’t find many cats in a neighborhood with Chinese restaurants. Arrests reflect the number of times the crime occurs. At the Capitol Hill Metro station there are very few arrests for fare evasion, unless Antifa is in town. I suppose the system could post a Turnstile Jumper Apprehension Team, where it would be as lonely as the Maytag repair man, but it would not be a good use of taxpayer funds. The ACLU is among the professional agitators pushing decriminalization. Nassim Moshiree explains, “Absolutely there’s been a raised consciousness on this that did not exist 20 or 30 years ago.” And right he is, since approximately 30 years ago is when the New York City subway system was a dangerous and disgusting carnival of aberrant behavior that repelled riders. The New York subway started its climb out of the sewer when respect for if not the rule of law, then at least the consequences of law was reestablished. Today none of these preening social justice warriors remember those days. Instead they are more than willing to risk the safety of your commute in the future to appease law breakers today. A select group of Bay Area Rapid Transit (BART) passengers discovered what happens when government ignores the “Broken Windows” theory of policing in favor of the left’s “Let It All Hang Out” philosophy. “Broken Windows,” introduced by James Wilson and George Kelling, held that a community starts to deteriorate when political leadership de–emphasizes enforcement of “quality of life” ordinances. Wilson and Kelling used the example of a building with a couple of broken windows. If the windows aren’t repaired, vandals will continue to break windows until there is no glass at all. Failure to repair the first few signals that there won’t be any consequences for breaking more in the future. Deterioration continues until vandals break into the building and destroy the inside, too. The social scientists contended the same thing happens in cities. If law enforcement ignores “quality of life” crimes like public urination, drinking in public, littering, graffiti and vandalism then disorder spreads and escalates. By 1990 William Bratton, chief of New York City’s Transit Police, was tired of supervising the transit equivalent of Subway from Hell so he ordered his troops to crackdown on quality of life offenders. Plainclothes cops started arresting fare jumpers, aggressive panhandlers and vandals. Crime plummeted as a result of enhanced enforcement. New York’s subway system became safe enough for politicians to ride. For most of us that’s a lot of money, but for some BART board members it was a small price to pay if it kept BART cops from harassing minorities. “We don’t want to create more problems than we solve,” she explained. So while the board was dithering a problem created itself. Five days after Simon pooh–poohed a plan for fare enforcement, a mob hijacked a BART train. As reported by SFGate, “A mob of 40­60 young people streamed onto a BART train in Oakland Saturday night, robbing multiple riders of bags and cell phones and injuring at least two people. Once the sympathy was out of the way, BART reverted to best practices for leftists that put a higher priority on political correctness than keeping the peace. It lied. Only crime isn’t down. Crime is up 22 percent in the first quarter of 2017. In fact crime is so obvious and out of control that acting chief Jeffery Jennings has declared a state of emergency. Sympathy after the fact would not have been necessary if BART management practiced competence before the incident. Ignoring an obvious and expensive problem like rampant fare jumping only encourages the practitioners to push the limits and escalate their law breaking. A sensible solution would be to let the data determine where to enforce. I think the term for that is science and the left claims to be the party of science. The system has cameras in the stations and it can determine which stations are hotspots and at what time incidents occur. This common sense research might have prevented the taking of the BART train, since it occurred right after a juvenile–heavy event ended. There is no indication the board will even try to mine the data. Adopting a “Broken Windows” policy might result in too many minority arrests, so the board is willing to risk a few broken heads. I’m not so sure passengers on the Dublin–bound train agree with that choice. Quality of life laws aren’t designed to inflict discrimination; they’re designed to establish a baseline for public behavior. These laws protect the elderly, the infirm, the young, the female and the wimpy, while restraining the unruly. Regardless of whether government tolerates broken windows or broken turnstiles, it always leads to broken heads in the end.